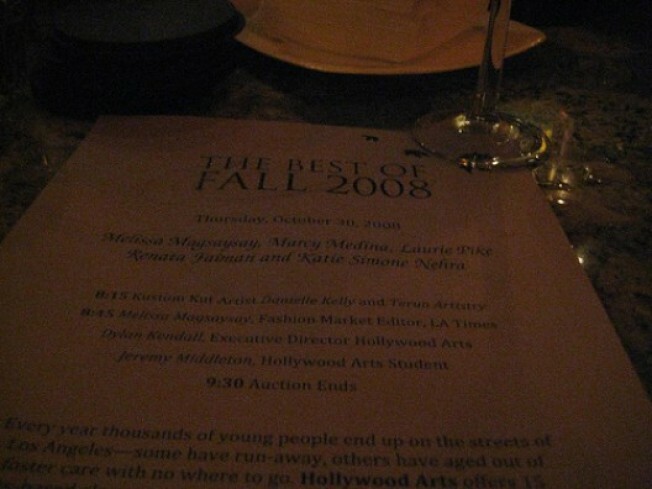 Hollywood Media+Arts, the groundbreaking school that uses the arts, media and music to help homeless young people prepare for successful futures, was Thursday night's beneficiary at the first annual Best of Fall 2008 event at the newly opened Bardot at the Avalon Hollywood. The 75+ guests took part in a silent auction, featuring a large hand-selected collection of favorites (men's, women's, and kids') hand-picked by top fashion editors. Items included spa packages and dream vacations, and selections from brands such as Versace, Dolce & Gabbana, Bulgari, Diesel, Rachel Pally, Lia Sofia Jewelry, Frédéric Fekkai, Oliver Peoples, K-Swiss, Miss Sixty, Taryn Rose, Smashbox Cosmetics, 7 for All Mankind, Anya Hindmarch, Geren Ford, Logitech and more. The benefit was thrown to help subsidize the lack of funding due to a struggling economy. Those interested in volunteering or donating should check here.